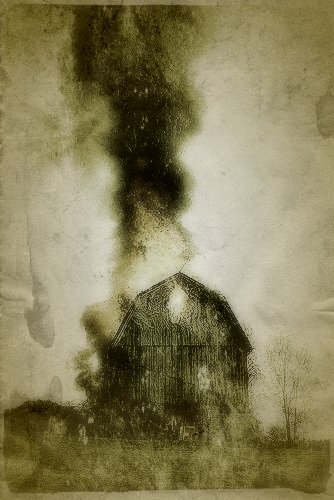 On August 14, 1948, a barn burned to the ground on the farmer of Charles Willey, who lived outside of Macomb, Illinois. Such an event would not seem to be much cause for alarm except for the fact that the source of the fire has never truly been explained – plus, it was just one of hundreds of fires that broke out on his property in the summer of 1948. The only person connected to each of those fires seemed to be his niece, a teenager named Wanet, who may have been starting them with her mind! Following her parents’ bitter divorce, Wanet and her father moved to the Willey farm. Wanet was unhappy and disturbed and emotions were running high that summer, which may have been the reason for the mysterious fires. They began on August 7. At the time, the residents of the farm included Willey, his wife, his brother-in-law and Wanet’s father, Arthur McNeil and McNeil’s two children, Arthur Jr., 8, and Wanet, who had recently turned 13. The first fire began, not as a blaze, but as a small brown spot that appeared on the wallpaper in the living room of the Willey farm house. That first spot was followed by another and then another. The spots would appear, spread out several inches as they smoldered and then, when they became hot enough, the spots burst into flames. The brown spots occurred day after day, leaving the family confused and befuddled. Willey called on several of his neighbors to investigate but they were as mystified as he was. However, many of them stayed on the property, crowding into the house and even sleeping on the floor in an attempt to help keep watch over the situation. Pans and buckets were filled with water and placed all over the house and each time one of the small fires broke out, it was quickly dowsed. Regardless, the fires kept popping up in front of the startled witnesses. As word spread, friends and neighbors came to help but could find no cause for them. Macomb’s Fire Chief, Fred Wilson, was just as confused as everyone else. In the days that followed, fires also appeared outside of the house on the front porch. Curtains were ignited in several of the rooms, an ironing board burst into flame and a cloth that was lying on a bed burned so hot that it turned into ash. Chief Wilson had never seen anything like it before. Charles Willey contacted his insurance company and their investigators were just as confused. Deputy State Fire Marshal, John Burgard, was contacted by Chief Wilson and he too came to the Willey farm. He was also confused by the strange events. "Nobody has ever heard anything like this," he announced to the press, "but I saw it with my own eyes". In the week that followed, more than 200 fires broke out at the house, an average of nearly 20 each day. Finally, on Saturday, August 14, one of the blazes raged out of control and before the Macomb fire department could be summoned with trucks, the entire Willey farm house was consumed. Charles Willey drove posts into the ground and made a tent shelter for he and his wife, while McNeil and the children moved into the garage. The next day, while the Willey’s were milking cows in the barnyard, the barn burst into flames and destroyed the building. Two days later, on Tuesday, several fires broke out on the walls of the milk house, which was being used as a kitchen and dining room for the family. On Thursday morning, there were two more fires and a box that was filled with newspapers was found burning in the chicken house. A few minutes later, Mrs. Willey opened a cupboard door in the milk house and discovered more newspapers smoldering on a shelf inside. There had been no one else in the building and the cabinet had not been opened. There was no logical reason for the newspapers to have caught fire. Later that day, at about 6:00 p.m., the farm’s second barn caught fire. The blaze burned so hot that the entire building was destroyed in less than a half hour. Firefighters who arrived on the scene were unable to get close to the inferno. Only six small outhouses remained on the farm, so the family escaped to a nearby vacant house. Regardless, the fires continued. The United States Air Force even got involved in the mystery. They suggested that the fires could be caused by some sort of directed radiation, presumably from the Russians, but could offer no further assistance. By the end of the following week, the farm was swarming with spectators, curiosity-seekers, official and self-appointed investigators, and reporters. Over 1,000 people came to the farm on August 22 alone. Theorists and curiosity-seekers posed their own theories and explanations. They ran the gamut from fly spray to radio waves, underground gas pockets, flying saucers and more. The authorities had a more down-to-earth explanation in mind. They suspected arson. They realized that they could not solve the riddle as to how fires could appear before the eyes of reliable witnesses, but things were getting out of hand on the Willey farm. An explanation needed to be discovered, and quickly. On August 30, the mystery was publicly announced “solved”. The arsonist, according to officials, was Wanet McNeil, the slight, red-haired niece of Charles Willey. They claimed that she was starting the fires with kitchen matches when no one was looking, ignoring the witness reports of fires that sprang up from nowhere, including on the ceiling. Apparently, this little girl possessed some pretty amazing skills, along with a seemingly endless supply of matches – even though she was never witnessed holding any matches. After hours of “intense questioning,” she allegedly confessed. She stated that she was unhappy, didn’t like the farm, wanted to see her mother and most telling, that she didn’t have pretty clothes. The mystery was solved! This was in spite of the fact that witnesses to the fires had seen them appear on walls, floors and furniture, all when Wanet was not even in the room. This explanation pleased the authorities but not all of the reporters who were present seemed convinced. The hundreds of paranormal investigators who have examined the case over the years have not been reassured either. One columnist from a Peoria newspaper, who had covered the case from the beginning, stated quite frankly that he did not believe the so-called "confession". Neither did noted researcher of the unexplained Vincent Gaddis, who wrote about the case. He was convinced the case was a perfect example of poltergeist phenomena. What really happened on the Willey Farm? We will probably never know because the story just went away after that. Wanet was taken to Chicago for examination at the Illinois Juvenile Hospital but was found to be mentally normal by Dr. Sophie Schroeder, a psychiatrist. “She’s a nice little kid caught in the middle of a broken home,” she reported. She was later turned over to her grandmother and spent the rest of her teenage years untroubled by mysterious brown spots that appeared, spread and burst into flames. The insurance company paid Willey for the damage done to his home and farm and the farm house was later rebuilt. Arthur McNeil and his son moved back in with the Willey’s for a time before eventually moving out of state. Fire officials abandoned the case after the “confession” cleared up the mystery for them but privately, many of those involved continued to question what really occurred on the Willey farm for years afterward. Fire Chief Fred Wilson talked about the case for quite some time and later retired from his position convinced that something unexplainable had taken place. The reporters who descended on the Willey farm all received closure for the stories, whether they believed the conclusion or not, and the general public was given a solution that could not have possibly been the truth. Not surprisingly, the case is still listed as “unexplained” today.